The Global Volcanism Program has no Weekly Reports available for San Salvador. The massive compound San Salvador volcano dominates the landscape W of El Salvador's capital city of San Salvador. 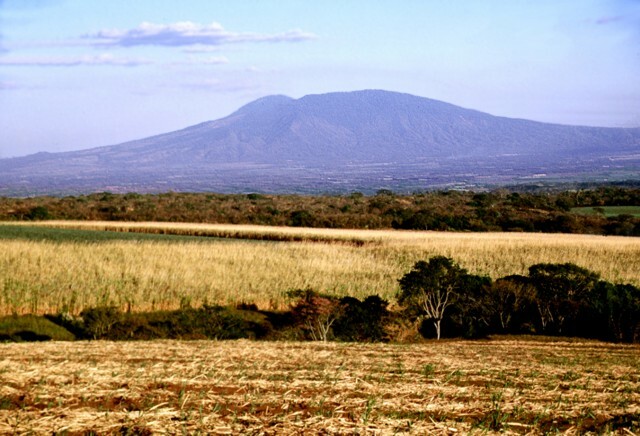 The dominantly andesitic Boquerón stratovolcano has grown within a 6-km-wide caldera whose rim is partially exposed at Picacho and Jabalí peaks, which themselves were formed by collapse of an older edifice about 40,000 years ago. The summit of Boquerón is truncated by a steep-walled crater 1.5 km wide and ~500 m deep that formed during a major eruption around 800 years ago. It contained a crater lake prior to an eruption during 1917 that formed a small cinder cone on the crater floor; a major N-flank lava flow also erupted in this year. Three fracture zones that extend beyond the base of the volcano have been the locus for numerous flank eruptions, including two that formed maars on the WNW and SE sides. Most of the four historical eruptions recorded since the 16th century have originated from flank vents, including two in the 17th century from the NW-flank cone of El Playón, during which explosions and a lava flow damaged inhabited areas. This volcano is located within the Joya de Ceren Archaeological site, a UNESCO World Heritage property. Major J J, Schilling S P, Sofield D J, Escobar CD, Pullinger C R, 2001. Volcano hazards in the San Salvador region, El Salvador. U S Geol Surv Open-File Rpt, 01-366: 1-23. Miller C D, 2002. Volcanology, stratigraphy, and effects on structures. 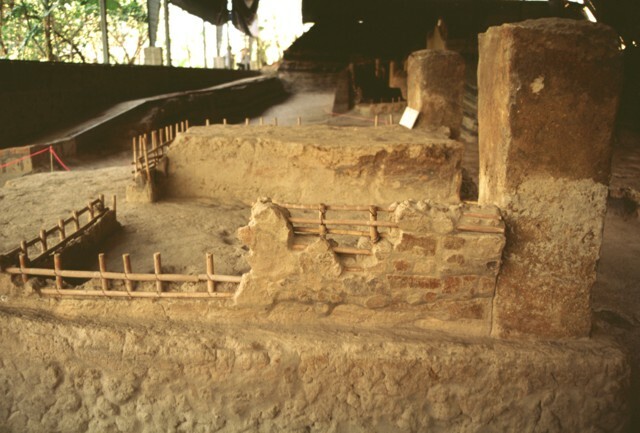 In: Sheets P (ed), Before the Volcano Erupted: The Ancient Ceren Village in Central America. Austin: Univ Texas Press, p 11-23. Sheets P (ed), 2002. Before the Volcano Erupted: The Ancient Ceren Village in Central America. Austin: Univ Texas Press, 226 p.
Sofield D, 2004. Eruptive history and volcanic hazards of Volcan San Salvador. In: Rose W I, Bommer J J, Lopez D L, Carr M J, Major J J (eds), Natural Hazards in El Salvador, Geol Soc Amer Spec Pap, 375: 147-158. [ 1806 ] [ Unknown ] Uncertain 0 El Playón ? There is no Deformation History data available for San Salvador. There is no Emissions History data available for San Salvador. This small andesitic cinder cone formed on the floor of the summit crater of the Boquerón cone at San Salvador volcano in 1917. The eruption began on June 6 from NW-trending fissures on the upper north flank of Boquerón. 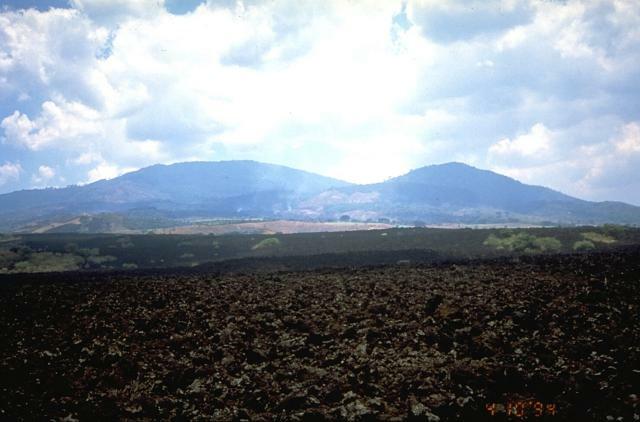 A chain of cinder cones formed, and a lava flow traveled to the northwest, cutting the railroad between Quezaltepeque and Sitio del Niño. 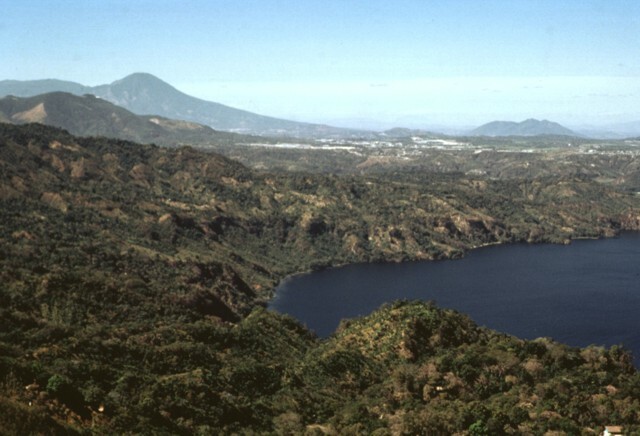 The Boquerón summit crater lake began to boil by June 10 and disappeared by June 28, after which this small cone (Boqueroncito) formed on the crater floor. Photo by Mike Carr, 1979 (Rutgers University). 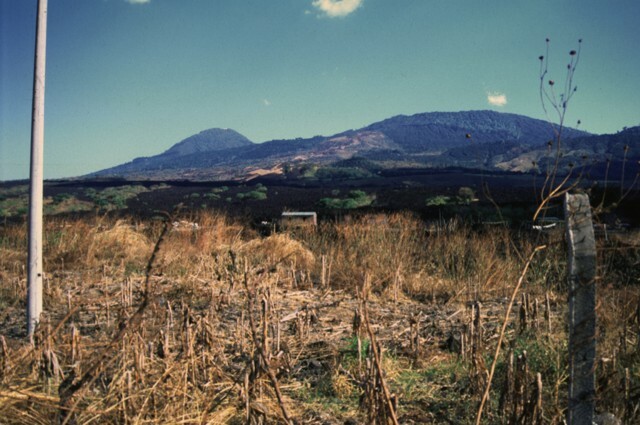 The barren lava flow in the foreground was formed during a 1917 eruption from vents on the flank of Boquerón stratovolcano, the rounded peak at the left. The lava flow cut the railway SW of Quezaltepeque. 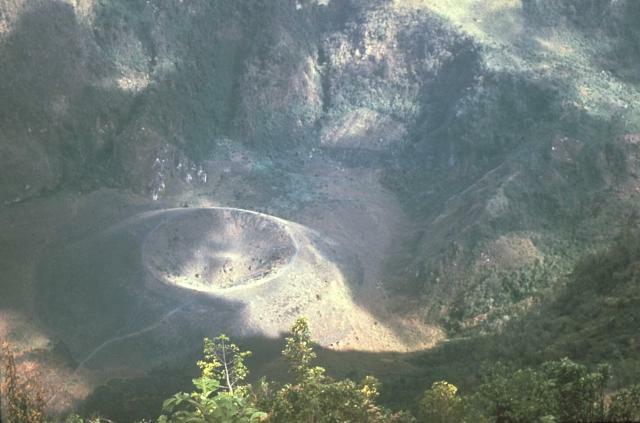 The 1917 eruption also produced a small cinder cone in the summit crater of Boquerón. Boquerón has grown within a 6-km-wide caldera whose western rim forms El Jabalí peak (right). Three fracture zones that extend beyond the base of the volcano have been the locus for numerous flank eruptions of Santa Ana volcano. Laminated pyroclastic-surge deposits at the right surround the walls of houses buried by an eruption from Laguna Caldera, a cinder cone on the lower NW flank of San Salvador volcano. This eruption was radiocarbon dated at about 590 CE and buried at least three Mayan homesteads beneath more than 4 m of scoria and ash. Archeological excavations near the hamlet of Cerén have revealed insights into Protoclassic Mayan life. 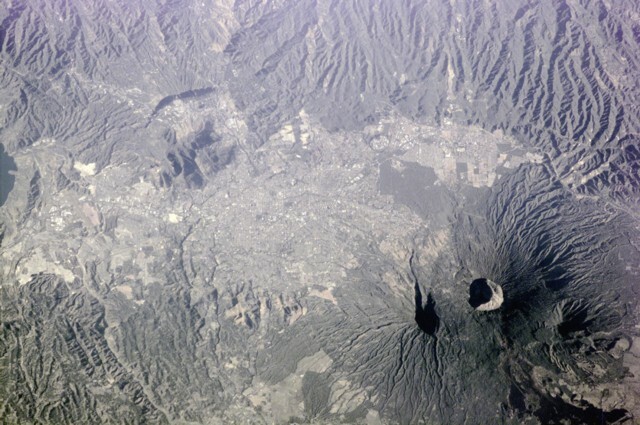 Boquerón volcano, its summit cut by a steep-walled, 500-m-deep crater, was constructed within a 6-km-wide caldera whose largely obscured rims are visible in this aerial photo from the WSW. The caldera cut an older San Salvador edifice, remnants of which are visible at El Picacho peak (in the shadow behind Boquerón) and El Jabalí (the low peak at the lower left). The buried caldera rim in the foreground is defined by the change in degree of dissection of the volcano's flanks. Guazapa volcano can be seen in the distance at the top of the photo. 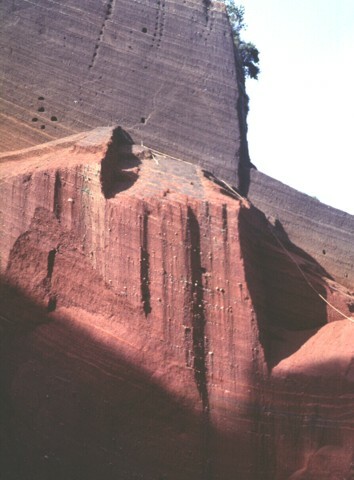 Oxidized reddish scoria deposits are exposed in a quarry on Cerro el Cerrito, a pyroclastic cone on the lower northern flank of San Salvador volcano. This cone (also known as Quezaltepeque, El Realenco, or El Cerrito Balestrera) is located immediately SE of the town of Quezaltepeque and is the NE-most of a chain of NE-SW-trending cones erupted along a fissure cutting across the northern flank of San Salvador volcano. 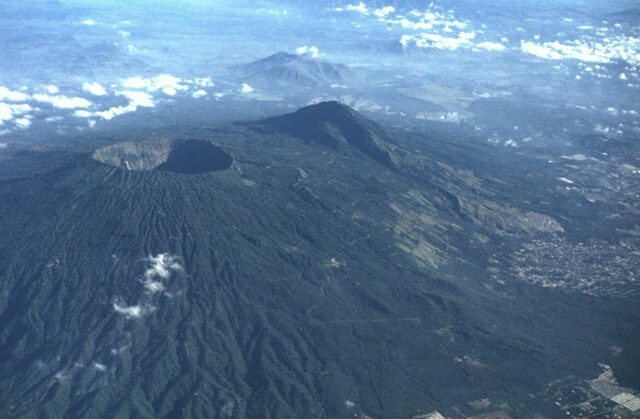 The 1.5-km-wide Boquerón crater (left) was formed during a major eruption about 1200 CE that truncated the summit of the post-caldera Boquerón stratovolcano. The 0.3-0.5 cu km San Andrés Talpetate Tuff produced during this eruption extended primarily to the west and was accompanied by pyroclastic flows. The eruption was named for the San Andrés archaeological site, where it was first identified. The outskirts of the city of San Salvador encroach on the volcano at the right. A cable car line to San Jacinto on the SE side of the city of San Salvador provides access to this impressive vista of the massive compound volcano of the same name towering above the sprawling capital city of El Salvador. 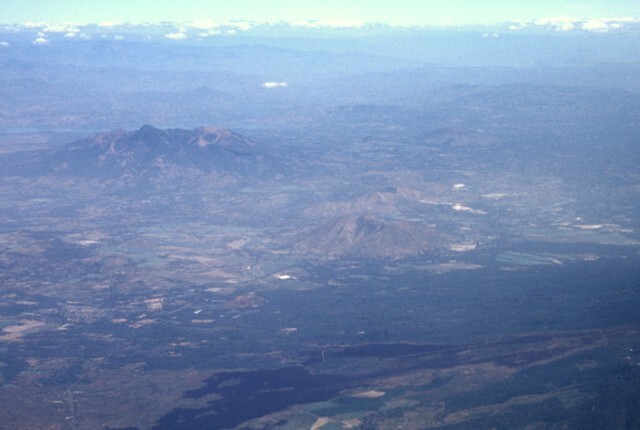 The flat-topped peak at the left is Boquerón stratovolcano, which has grown within a 6-km-wide caldera formed by collapse of the older El Picacho volcano (the peak at the right) and another volcano to the NW. Most of the four historical eruptions recorded at San Salvador since the 16th century have originated from flank vents. The dark-colored lava flow in the center of the photo originated during an eruption in 1917 from a vent high on the northern flank of Boquerón volcano (upper right). On June 6, 1917 an eruption began from NW-trending fissures on the upper north flank of Boquerón. 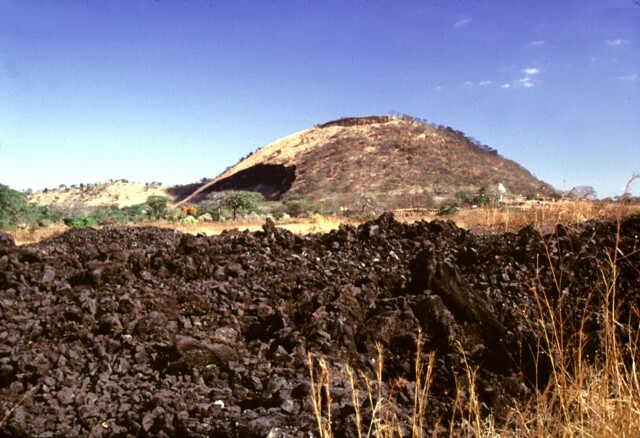 A chain of cinder cones formed and a lava flow traveled to the northwest, cutting the railroad between Quezaltepeque and Sitio del Niño. Eruptive activity also occurred at the summit crater of Boquerón, where a small conelet formed on the crater floor. El Picacho peak is at the left. 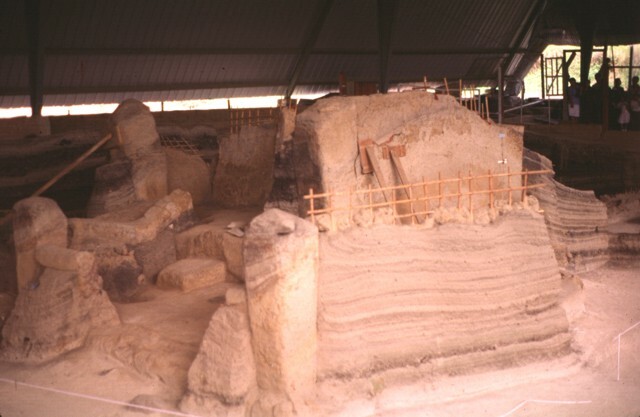 An excavation at the Joya de Cerén archaeological site near the hamlet of Cerén shows pyroclastic-surge deposits from the 590 CE eruption of Laguna Caldera lapping against Mayan buildings. 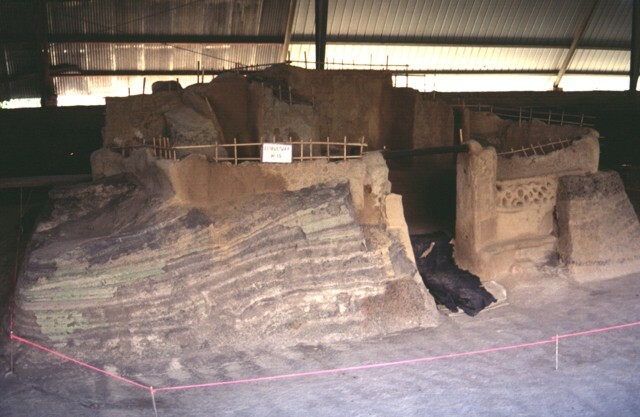 The excavation has unearthed several small Protoclassic Mayan homesteads that were buried by this eruption from a cinder cone on the northern flank of San Salvador volcano. The eruption occurred suddenly, as seen from the remains of uneaten meals left by occupants who fled their houses. An archeological excavation near the hamlet of Cerén has unearthed several small Protoclassic Mayan homesteads that were buried by an eruption from nearby Laguna Caldera, a cinder cone on the northern flank of San Salvador volcano. The eruption occurred suddenly, as seen from the remains of uneaten meals left by occupants who fled their houses. The eruption was radiocarbon dated at about 590 CE. The massive Pleistocene Guazapa stratovolcano (left-center) is seen here in an aerial view from the SW with the Río Lempa behind it. The youngest flank vent of Guazapa is Cerro Macanze, which lies on the SE flank of the volcano, behind the two small volcanoes in the right-center part of the photo. The dark-colored unvegetated lava flow in the foreground was erupted in 1917 from the flank of San Salvador volcano. El Playón cinder cone on the lower NW flank of Santa Ana volcano was formed during an eruption in 1658. An explosive and effusive eruption began immediately following a major earthquake on November 3, 1658 that destroyed San Salvador City and surrounding areas. Ash fell in Comayagua, and a lava flow (left horizon) traveled to the NE and surrounded the village of Nejapa. The dark-colored lava flow in the foreground originated in a 1917 eruption from a vent on the upper northern flank of San Salvador. Flat-topped Cerro Alto (right center), a 953-m-high cinder cone on the SE flank of Coatepeque caldera, is seen here from the southern rim of the caldera. Basaltic lava flows were erupted from the eastern side of the cinder cone. Cerro Alto predates formation of Coatepeque caldera and is blanketed by deposits from the caldera-forming eruptions. San Salvador volcano to the east forms the left horizon. The southern rim of Coatepeque caldera provides a dramatic view of the western side of San Salvador volcano. 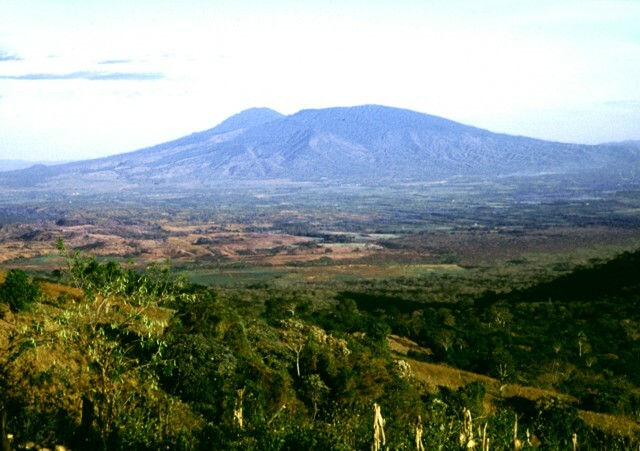 Flat-topped Boquerón volcano has grown within a large caldera cutting an older stratovolcano, of which rounded Picacho volcano to the left is a remnant. One of several cinder cones on the lower NW flank of San Salvador volcano is visible at the left-center margin. 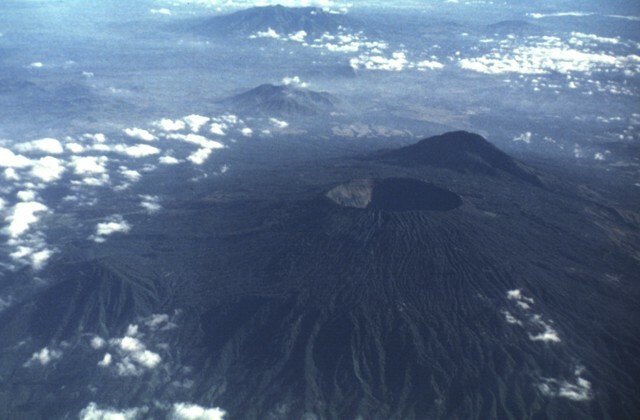 The flat, dark-brown colored area at the right center is the 1722 lava flow from San Marcelino cinder cone on the lower flank of Santa Ana volcano. 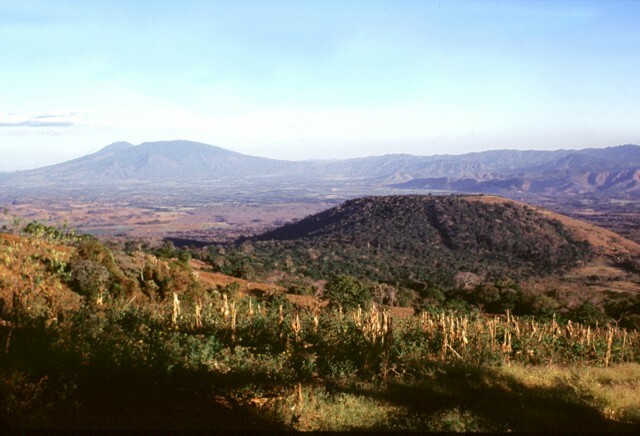 The western slopes of San Salvador volcano rise above the Zapotitán basin beyond sugar cane fields south of Coatepeque caldera. The western flanks of the volcano and the rounded El Picacho peak left of the summit are part of the ancestral San Salvador volcano, which collapsed around 40,000-50,000 years ago to form a 6-km-wide caldera. Flat-topped Boquerón stratovolcano subsequently overtopped much of the caldera rim, and lava flows traveled down the northern and southern flanks of the ancestral volcano, smoothing its profile. 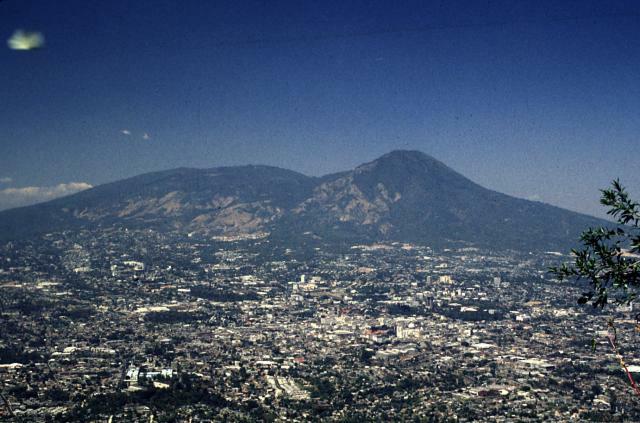 The E-W-trending capital city of San Salvador extends across much of this Space Shuttle image (with north to the bottom) and encroaches on the flanks of San Salvador volcano. The steep-walled Boquerón crater is 1.5 km wide and lies within a late-Pleistocene caldera whose eastern wall is highlighted by the shadow left of Boquerón. The dark-colored area at the bottom right is a flank lava flow produced during the 1917 eruption of San Salvador volcano. 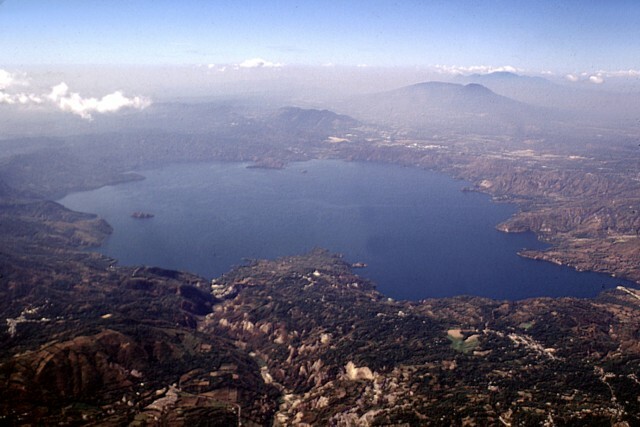 The western tip of Lake Ilopango is visible at the left-center. NASA Space Shuttle image ISS001-E-5903, 2001 (http://eol.jsc.nasa.gov/). 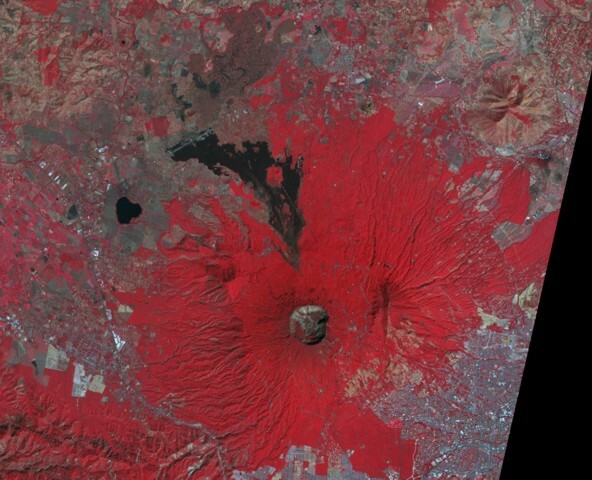 The false-color NASA ASTER image (with north to the top) looks down on the 1.5-km-wide summit crater of San Salvador volcano. The prominent dark-colored lava flow on the north side of the volcano was erupted from a flank vent in 1917. The tiny circular cone in the center of the summit crater was also erupted in 1917. The NW distal margin of the flow is cut by a highway. Lake-filled Laguna de Chanmico maar lies on the lower NW flank of the volcano at the left-center. The capital city of San Salvador is at the lower right. Large Eruptions of San Salvador Information about large Quaternary eruptions (VEI >= 4) is cataloged in the Large Magnitude Explosive Volcanic Eruptions (LaMEVE) database of the Volcano Global Risk Identification and Analysis Project (VOGRIPA).